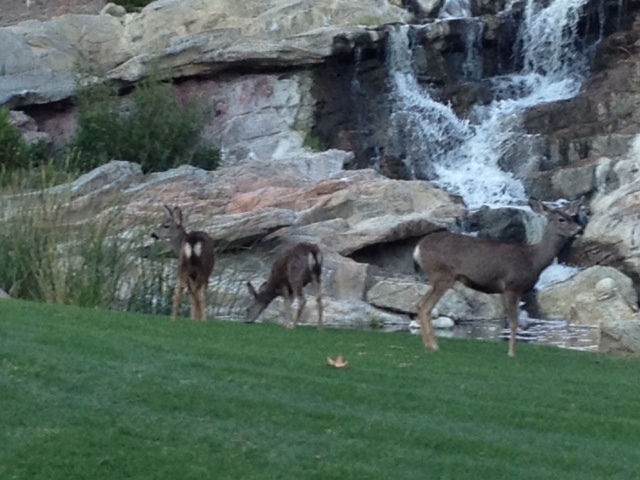 JC Golf is proud to announce the latest addition to its golf family: Carmel Mountain Ranch. 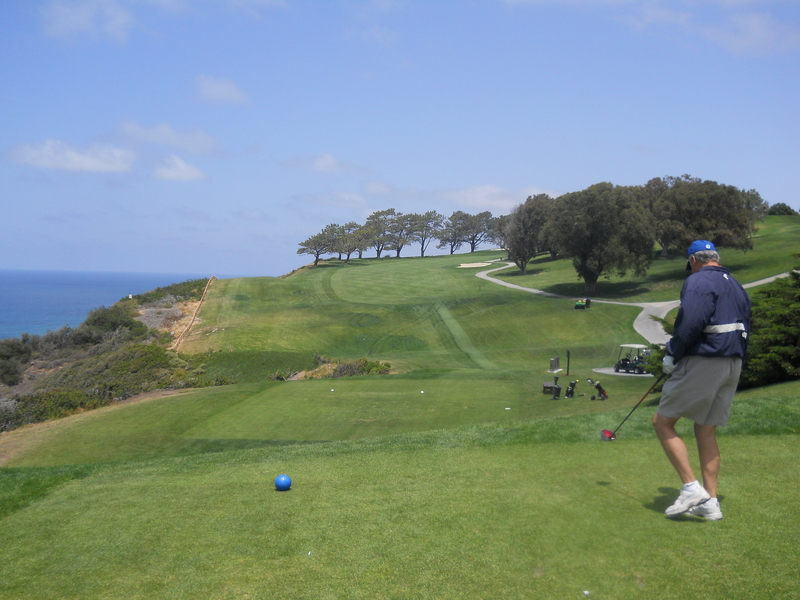 Situated just 25 minutes from downtown San Diego, Carmel Mountain Ranch has been serving golfers from all over San Diego County and beyond since 1984. 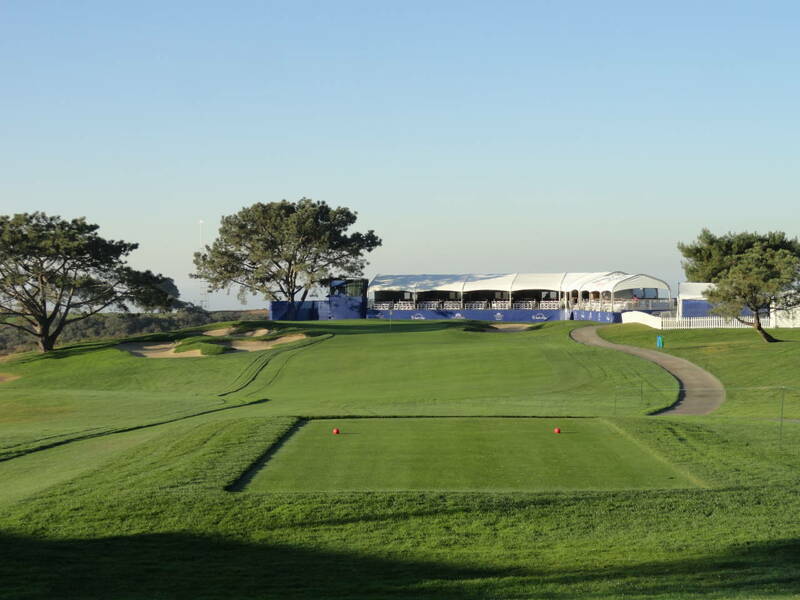 In the past, it has even hosted U.S. Open qualifying as well as a variety of other tournaments and events. At 6,599 yards (from the back tees), Carmel Mountain is a mid-length course that requires a good deal of strategy but also has a fair amount of holes that allow big hitters to let it fly. Prior reviews of the course have called it “a true shot-maker’s course,” and it is that, especially on some of its short par-4s, which take a few rounds to learn. Carmel Mountain General Manager Kevin Hwang says the course has a reputation for being rough for first-timers. “The course has a reputation for being tough, but we’re in the process of trying to ease that burden for people,” Hwang says. That’s mostly by managing speeds on the course’s undulating greens. 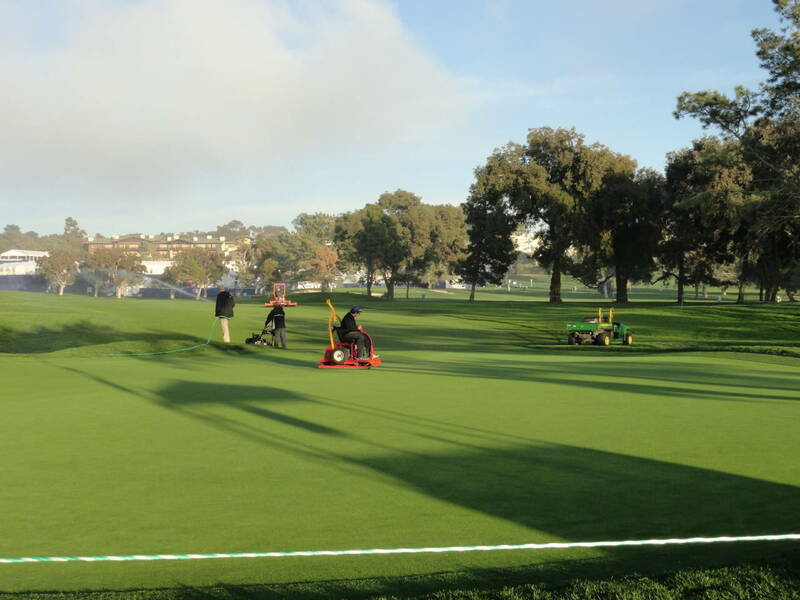 Hwang says the course’s tiered greens can yield a bevy of three-putts if not managed properly. “The greens are a little tricky, which is why don’t let them run too fast,” he says. The course has many unique holes, but the signature is the beautifully landscaped par-3 11th, which plays to 158 yards and involves a carry over a pond and waterfall. The pin was front right the day I played and I just missed having my tee shot pull back to the hole on the undulating green. “It’s actually our shortest par-3. It’s a lot fun to play,” Hwang says. 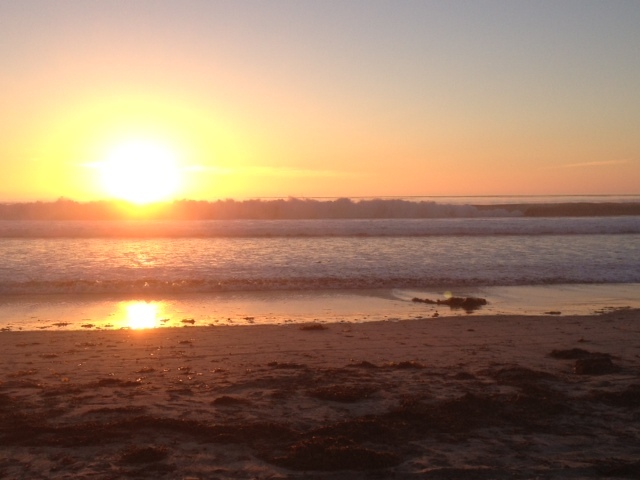 The following is a look at few more things you can look forward to during future rounds at Carmel Mountain Ranch. 1. Great Driving Holes – If you’re striping it off the tee to start, you can really take advantage of the first two holes, both of which are downhill par-4s. You’re set up for a similarly strong start on the back with the downhill par-5 10th and then there’s another dramatic downhill on the par-4 14th. The par-5 10th is most definitely reachable in two with a solid drive, and the wide fairway offers multiple angles of attack as long as you avoid the bunkers on the right. The large, receptive green makes a great opportunity to kick off your back nine with a birdie. This used to be the starting hole, by the way, until the nines were reversed. So if you haven’t played the course for a while, be aware of that. 2. 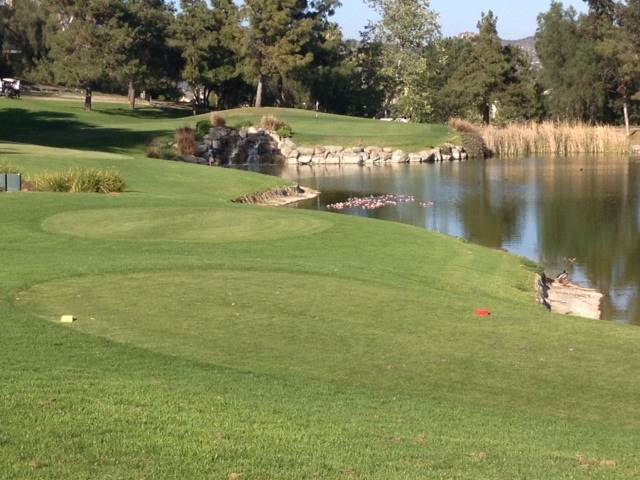 Unique Views – Having beautiful mountain vistas as a backdrop is common in this part of Southern California, but what is a bit uncommon is how much the course’s design incorporates its surroundings. For instance, on the drive to the par-4 14th, you’re greeted by a field of huge boulders and actually drive between two of them to reach the tee box. 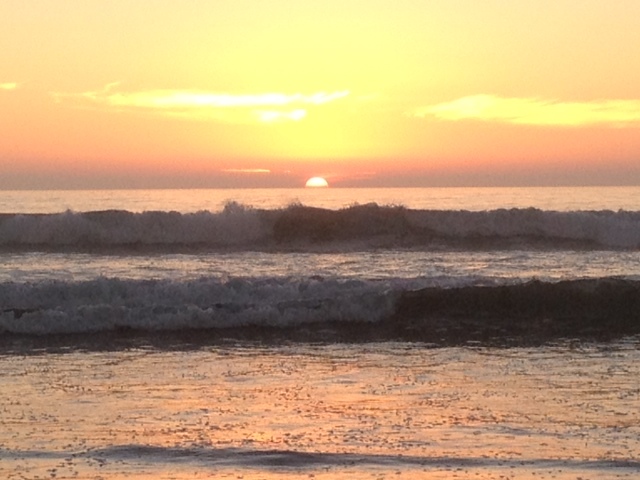 It’s stunning every time you experience it, but particularly the first time. 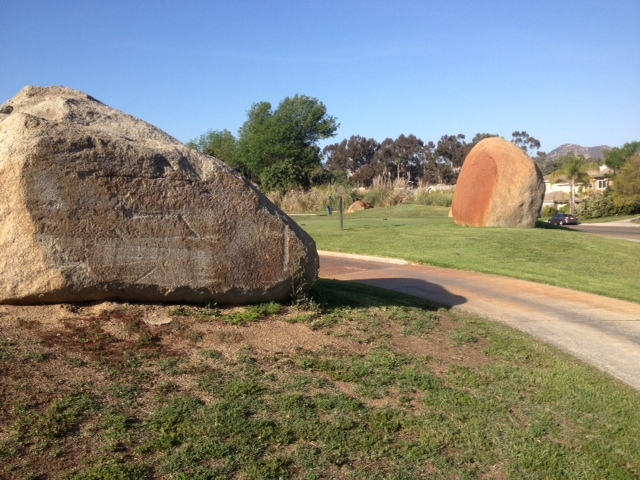 You’ll find similarly sized stones in fairways and sand traps throughout the course. Also unique to the area are the hawks and falcons you’ll see soaring and circling above, riding the breeze and giving you a glimpse of nature’s wonders at work. 3. Unique Holes – Because the course was designed to maximize course exposure for the homes, many holes are set off in their own amphitheater. The product of that design is an uncommonly unique layout. Two of the most talked about, and unique, holes on the course are two short and highly strategic par-4s. The first is No. 7, which plays to 311 yards from an elevated tee. The number probably already has many of you ready to pull driver, but hold that thought. There’s a huge boulder surrounded by a sand trap lurking about 280 yards out. If you don’t make the carry, your ball could hit the boulder and bound OB or leave you in some other tricky predicament. An iron or rescue to a comfortable second-shot yard is the preferred play, but doesn’t dissuade many from going for the green. Driver isn’t an option, however, on the 325-yard par-4 17th. Front by a sizable pond, this short par-4 is a true two-shot hole. Carrying the water on the second shot has been many players’ undoing, Hwang says. And to a somewhat smallish green. I played the hole 7-iron, 6-iron, which was more than I wanted on my second shot, but I still managed the land the ball on the fringe and make a two-putt par. It may take you a few rounds to learn the best way for you to club No. 17, but you’ll find par to be a plenty good score there. 4. Practice bunker/short game area – As someone whose greenside sand game tends to be inconsistent, I find it a relief any time there’s a practice bunker available. 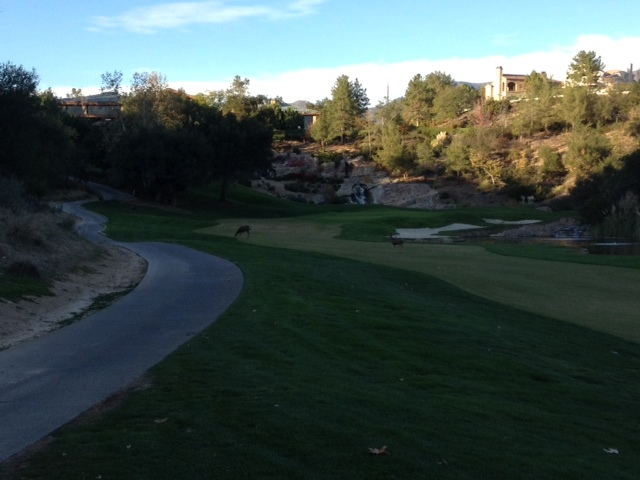 Carmel Mountain Ranch has one is its sizable short-game area. I practiced sands shots for about 15 minutes and it saved me a few strokes during my round. The bunker is a bit benign in that it doesn’t have steep walls, but it’s enough to get in some solid practice. There’s a separate green designated for chipping as well. All the pros say the fastest way to shave strokes is around the green. For your round, arrive early and make use of this valuable practice resource. The course used to have a driving range, but a virtual range has replaced it. 5. The Clubhouse – As you wind your wind up Carmel Ridge Road, you’ll know you’ve arrived when you see a stately Colonial-style clubhouse. The building gives a country-club presence to the course. “We’ve got great curb appeal,” Hwang says. Besides the pro shop, there’s a bar and grill/lounge area and an upstairs banquet facility with a patio. Feel free to stick around after your round and relax with a beverage and join us in a symbolic toast to the newest member of the JC Golf family. Carmel Mountain Ranch officially becomes a part of JC Golf on April 1, thus benefits for JC Players card members begin on that date. 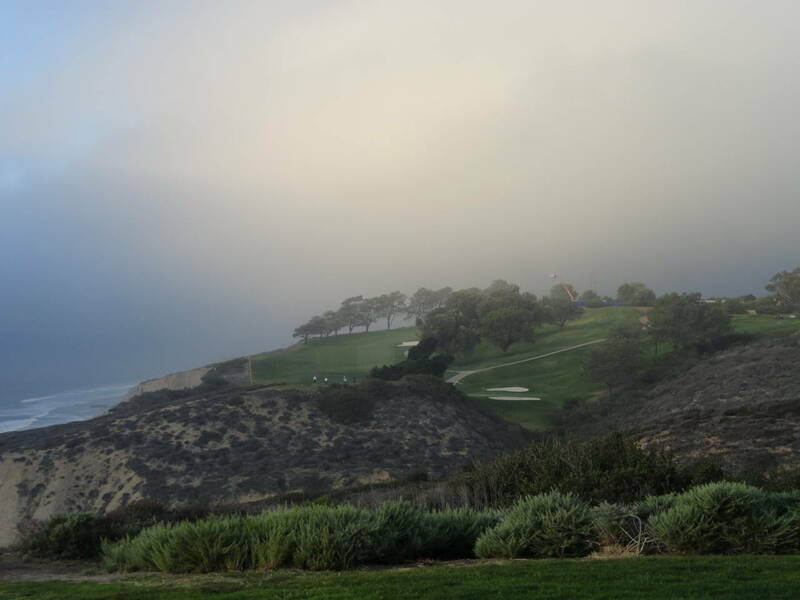 To book a tee time, please call 858.487.9224, ext. 1. 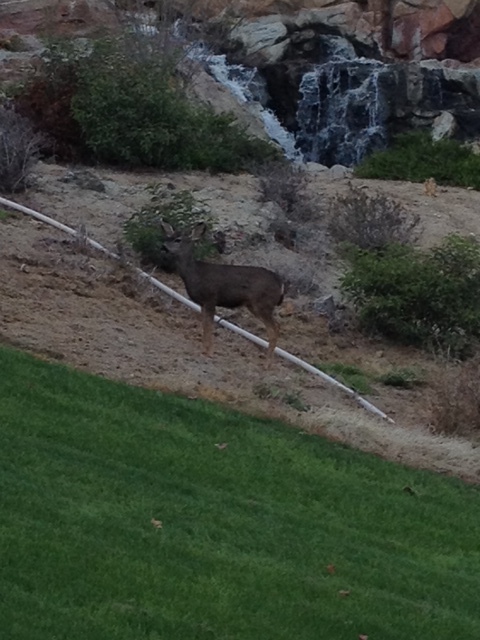 Spotted on the third tee of the South Course at Oaks North this morning. 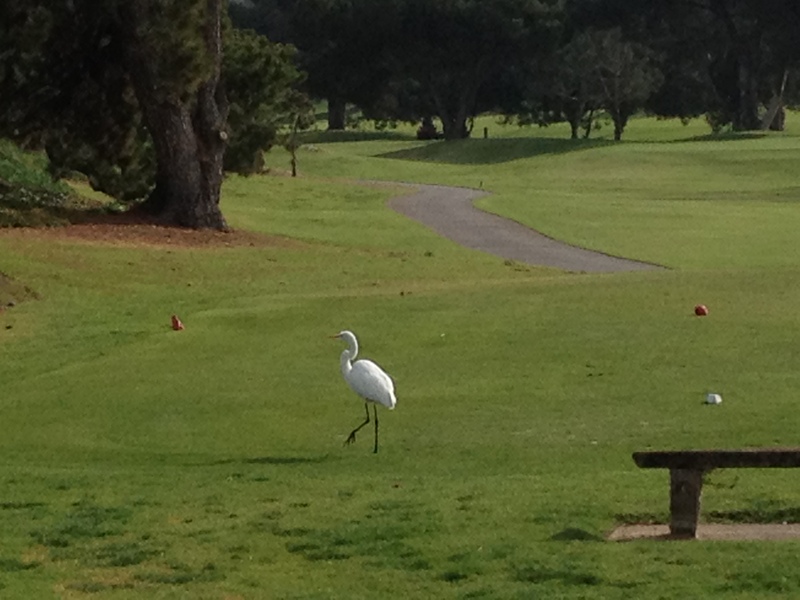 This camera-friendly heron lingered for a while and then allowed us to play through. 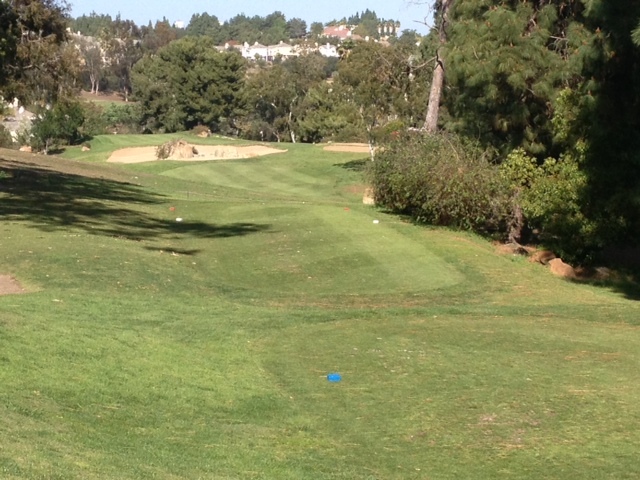 I wrote about the sweet post-round lemonade about Maderas Golf Club last year when I reviewed the course for the September issue of Southland Golf Magazine. However, that was in my less professionally sophisticated pre-blog days, so I didn’t have the chance to post the recipe. Well, consider this my mulligan. I was back to Maderas last week as part of media contingent that got to play the course in advance of the Farmers and re-discover why Maderas was ranked top 100 in Golf Digest’s list of U.S. public courses. 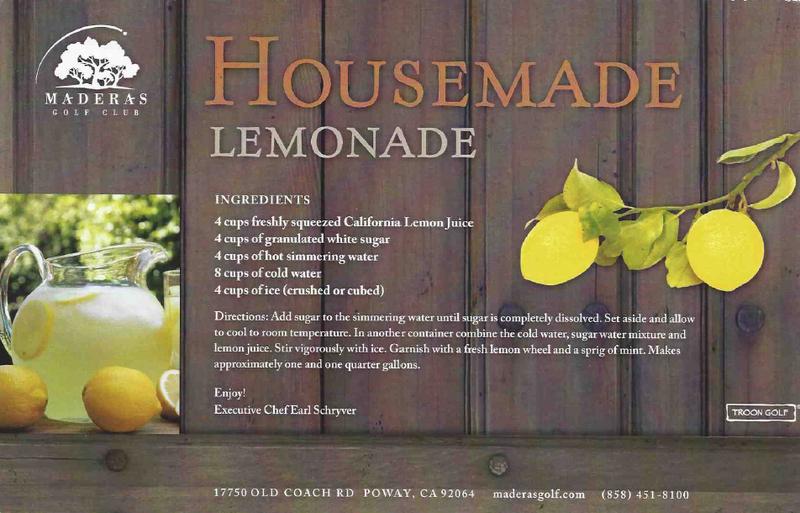 I’ve got another post coming about the Poway course and playing its diverse group of par-5s, which could be the best in the county, but I wanted to post the lemonade recipe today as a non-alcoholic option for your Super Bowl party. The recipe involves using California Lemon juice, which fits into Maderas’ culinary theme of offering tastes of the region, such as locally brewed craft beers and fish tacos. 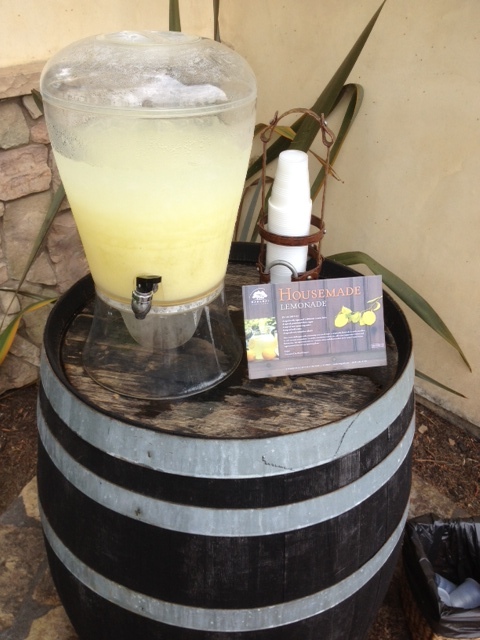 I find the lemonade to be an especially refreshing and unique end to a great day at Maderas. So for your enjoyment at home, I offer the recipe below. Cheers. 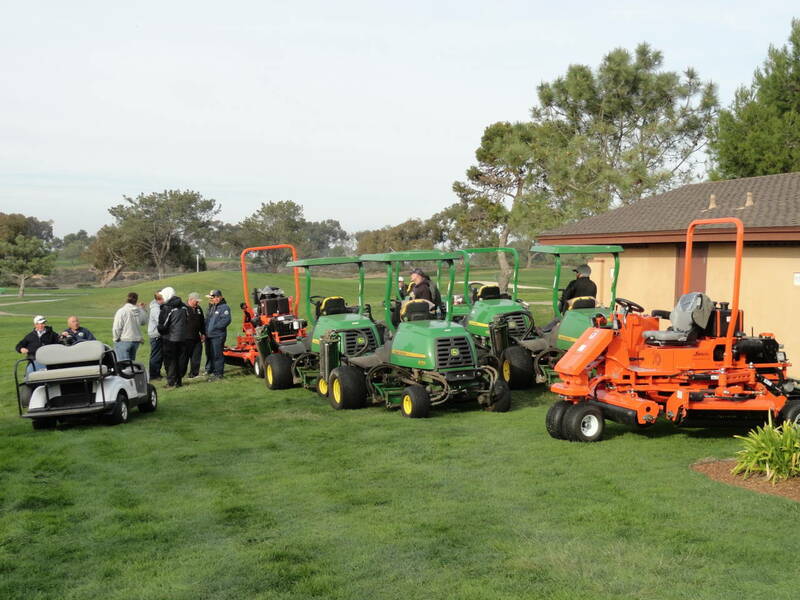 This is my final follow-up post to the preview piece I did for the January issue of Southland Golf where I documented the maintenance practices at Torrey Pines and how they prepare the course to peak for the Farmers Insurance Open. 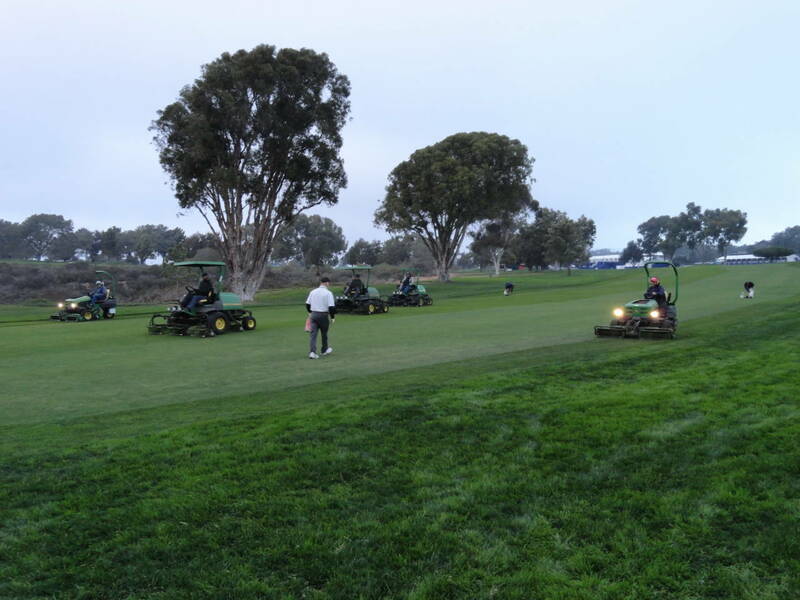 As a complement to that piece, I wanted to go back during the tournament and document the transformation, so, working again with Torrey’s head maintenance supervisor Paul Cushing, we ventured onto the South Course at about 3 p.m. Thursday. Because of the 30-minute fog delay to start the day, groups were still on the course, so Cushing and his crew had to wait a bit so as to not disturb play. After spending about 45 minutes watching Cushing and his crew work, I decided it might be best to just analyze the process over one hole, so here’s a look at the work on No. 4 on the South, which is where the grounds crew started and then worked toward the clubhouse. 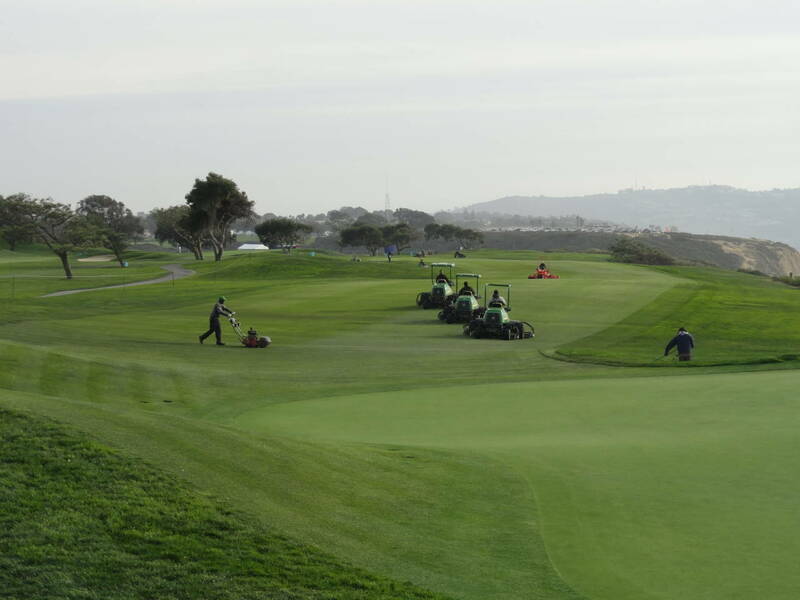 The following is a little photo essay about the process, which utilizes City of San Diego workers and volunteers each day to return the course to championship condition in about four hours at the end of each round. Cushing also shared that during Farmers week superintendents from across the country will fly in to work the tournament to get experience. 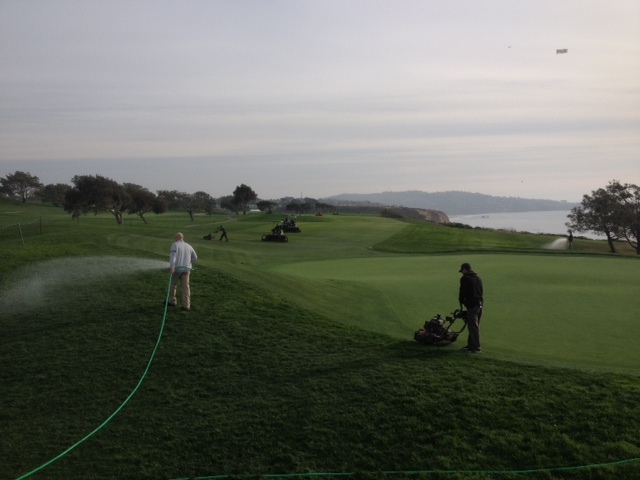 It was interesting to watch them work as a team and restore the shine to Torrey Pines. This is the maintenance crew and machinery staged near the 4th hole, awaiting the go-ahead from Cushing. The orange machine is worth noting. That’s a roller. It follows the mowers to help tighten the fairways. 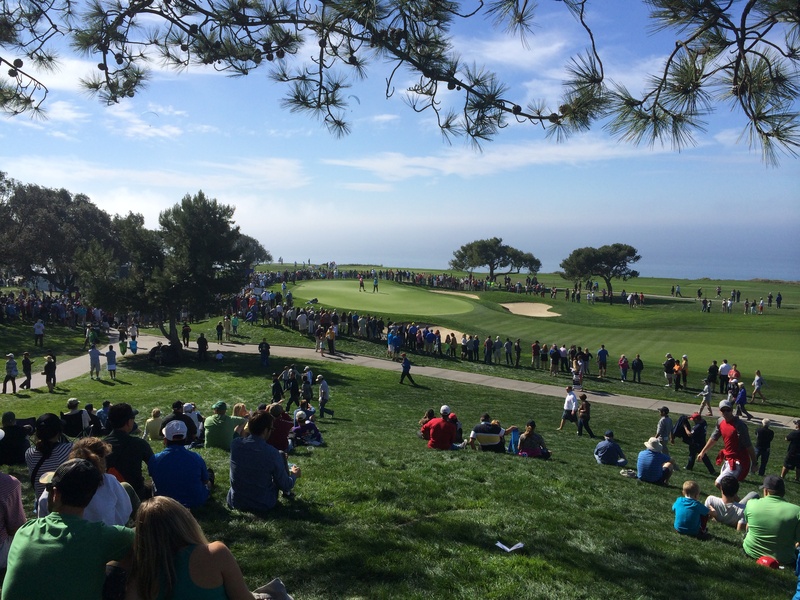 It’s a process Torrey added after Cushing worked the U.S. Open at The Olympic Club. This captures quite a bit of the process in a snapshot. 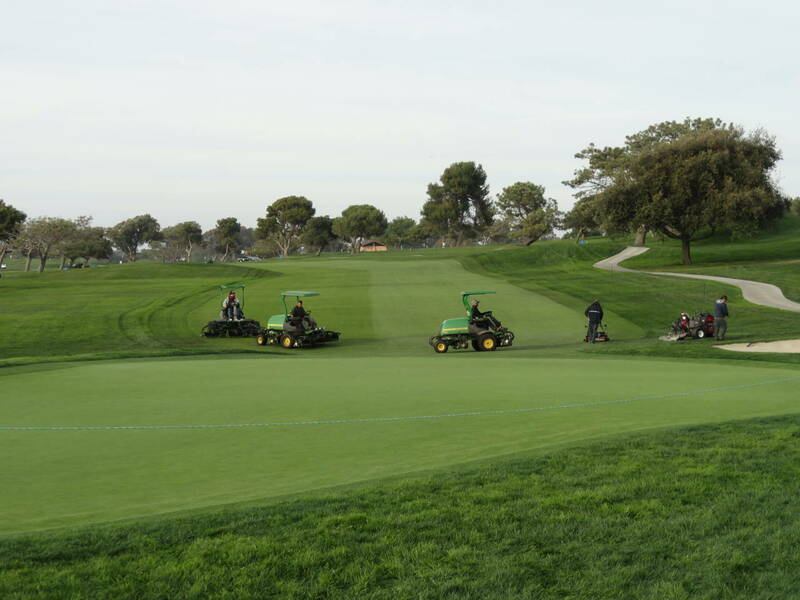 You can see the three mowers working in tandem in the fairway. They make one pass up and one pass back to keep turning to an absolute minimum. You can also see the hand-mowing on the approach and on the fringe. 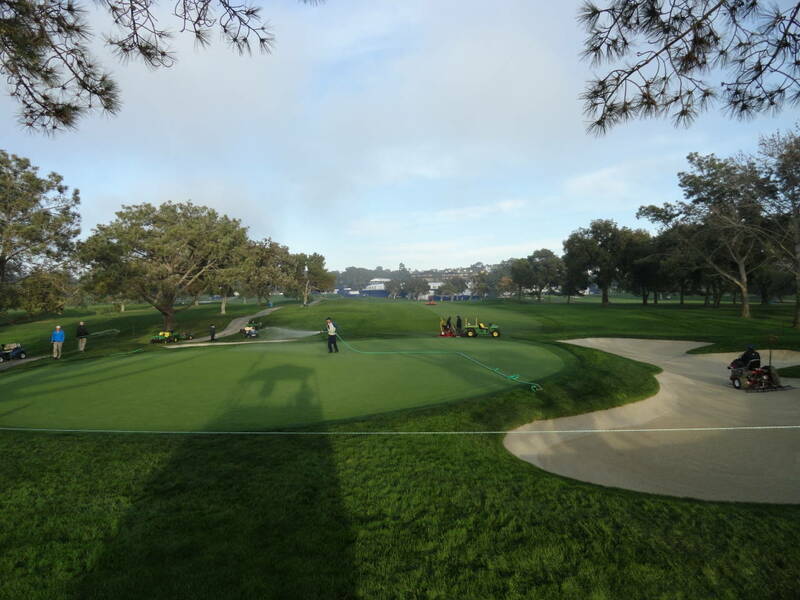 Then hand-watering takes place green-side and in the bunkers, but not on the green itself. 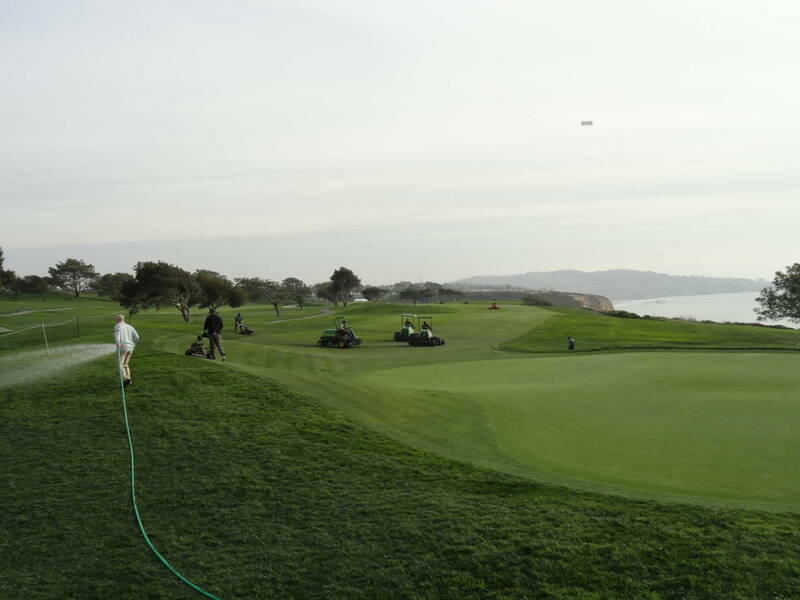 To maintain green speeds, the greens to unwatered, spritzed at most, during the tournament. One each hole, you’ve got about seven pieces of equipment and at least 12 workers working in unison. 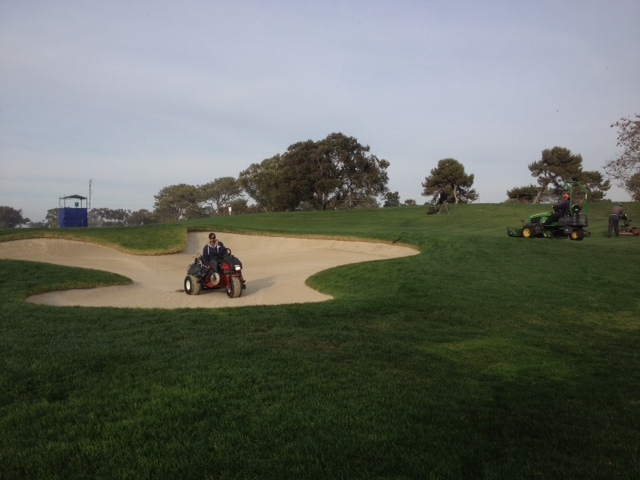 After the round, the bunkers are graded smooth in preparation for them to be hand-raked the next morning. Seemingly little things like bunker contours matter to players. The bunkers are raked to have the grain going toward the hole, which making it more conducive for an approach shot. 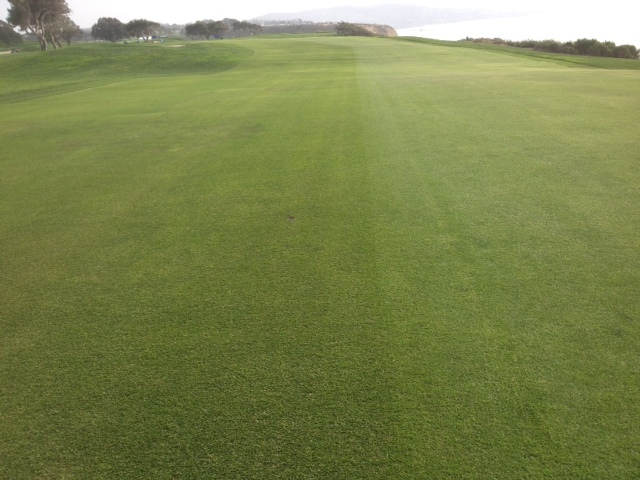 This shows the fairways making their return pass and, in the distance, you can see the roller working behind them. This is the half-and-half look the mowers achieve. As you can see, the effect is created by simply mowing in two different directions. While pleasing in person, the look is largely done for TV, Cushing says. The final phase of the transformation, which I neglected to get a photo of, is the volunteer crew that follows the machinery. They’re repairing the divots, which seemingly dot the fairway every two feet or less where approach shots are commonly taken. If there’s an imperfect divot, the loose turf has to be removed and the divot filled with a seed/sand mixture. It won’t heal overnight, but it at least re-starts the process, Cushing says. And then the crew moves to the next hole and the process starts all over again until both courses – the North and South – are completed. The one time-saver, at least on Thursday and Friday, is that hole locations don’t have to be re-cut. The pins and cups simply have to be removed and then replaced. Golfers who played the North Thursday play the South Friday and vice versa. I just wanted to say thanks again to Paul for sharing his time and his photos. I hope readers enjoyed this inside look at the process and gained a little appreciation for what it takes to make a championship golf course really sparkle. Excuse the golfer on the right, who walked into my shot. This is the uphill, dog-leg right No. 7 on the North Course. It follows the dramatic downhill par-3 and is the last of the ocean holes on the North Course. While the pros largely can be much more aggressive on the North than the South – look at Thursday’s scoring split – Scott Bentley, our resident pro, says this is one hole the pros still have to respect. Playing at over 400 yards, a 3-wood off the tee still leaves a 7- or 8-iron approach, and Bentley says pros can’t afford to miss long. It’ll be interesting to see today how many strokes the players who started on the South can make up on the North, including on No. 7. Just going to do a quick photo post today. I’m knee deep in wrapping up some freelance projects, but I wanted to share this from my round at La Costa earlier this week. 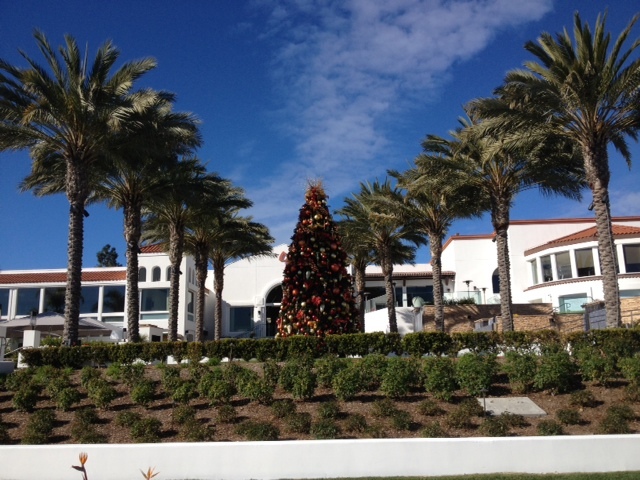 This is La Costa’s impressive Christmas tree. It’s quite striking from the course and the clubhouse’s bar and grill. The palm trees you see are lit up at night, making for quite a sight. If you get a chance to swing by, it’s recommended viewing to get you in the spirit of the season. There’s a great little outdoor patio that allows you to take in the full effect. Happy holidays. P.S. – I just checked the stats and the blog just had its highest viewership week yet. Thanks for all the views and follows. It’s greatly appreciated, and if you like what you’re reading, please pass the word. I’ll write more about Dove Canyon at a later date, but for now I’ll send you into the holiday weekend with some photos from the end of yesterday’s round. We had quite a special scene as we played No. 18. 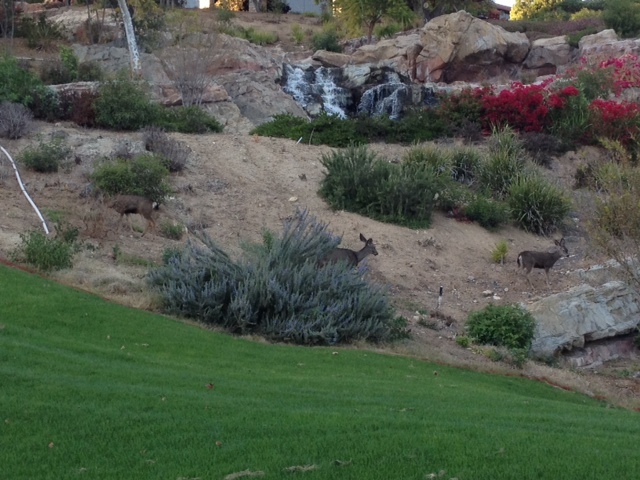 There were deer on both the fairway and around the green, probably seven in all. We saw at least 20 total during the round, a record for me, which is more than I could say for my scorecard. 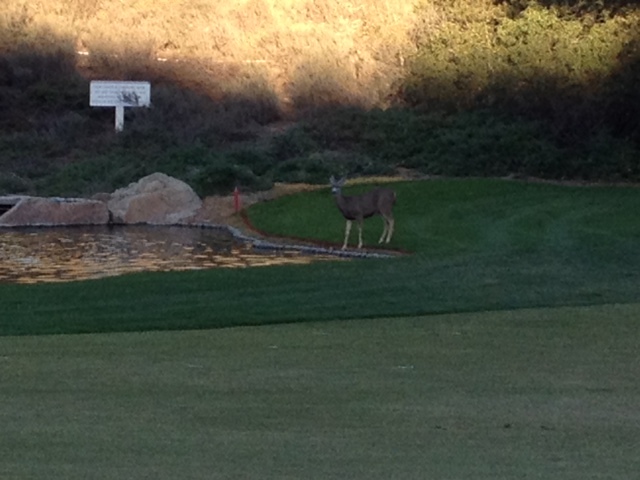 Anyway, here’s a glimpse of the deer who caused me to ponder the question: what’s better than a birdie on 18? 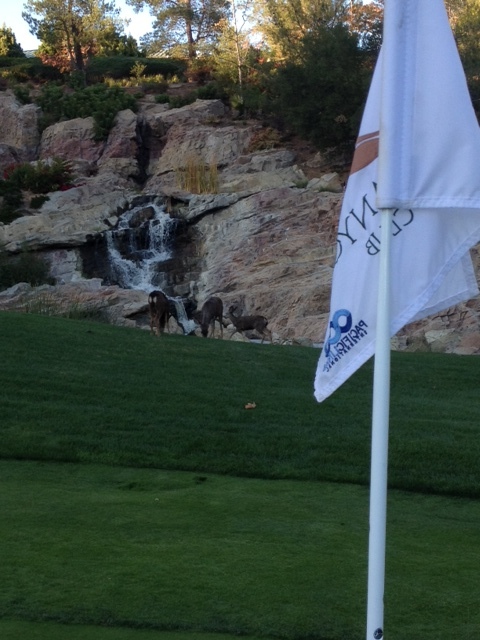 Answer: Five deer waiting for you on the green.